Ortofon, the world leader in high quality DJ cartridges is pleased to announce the shipment of the Rodec Scratchbox – a highly acclaimed 10-inch battle style mixer – to select USA dealers. 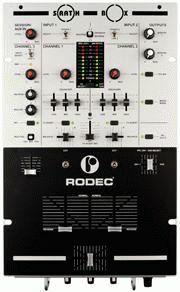 The Rodec Scratchbox is highly sought after by both scratch and mix DJs alike, due to Rodec’s reputation for manufacturing products which not only provide unparalleled sound quality, but also provide rock solid durability. The Scratchbox is no exception, as it combines hand-built quality with top-end components, providing the finest sound quality ever offered in the DJ products industry. The Scratchbox ships standard with an Infinium crossfader, and features a 3 year no-fault warranty which includes the faders. Rodec is a Belgian company with history dating back to 1954 and is credited with developing the first ever DJ mixers, starting in the 1970s. In addition, Rodec also created amplifiers, speakers, and live sound equipment with one common thread – their unrelenting approach to offering the absolute finest sound quality and build quality possible. Rodec is also credited with the invention of the 3-band EQ per-channel and the crossfader, innovations which have paved the way for DJs’ creativity. Shipments of the Rodec Scratchbox will begin this week from Ortofon’s US headquarters in NY. End users can expect availability before the end of July. If you are using the phono inputs and the record player has a ground wire, it can be connected to the ground. After connecting the music-sources you can select the phono or line input for each channel using the select-switch. By switching the VU select switch to input (the led will light up), the input signal of channel 1 will appear on the left VU-meter and the signal of channel 2 on the right VU-meter. This is very useful to compare the level of both signals. Adjust with the level control the input signal so that the yellow indicators of the level meters light up occasionally. By switching the channel routing switch from the upper position (STRAIGHT) to the lower position (REVERSE) you can direct the signal from channel 1 to channel 2 and vice versa. You can connect sound sources to channel 3 through the microphone input with a 8.0mV sensitivity or through the line input which has a sensitivity of 500mV. After connecting the sound source you must set the input selector to the type of input you're using (MIC or LINE). You can now set the pre-fade level of the channel using the input level potentiometer. The level should be set so that the 0dB-led only lights up at the peaks in the music. Use the EQ-knobs to control the treble and bass of the sound. Using the routing selector you can direct the sound either to the mix and control it with the channel 3 fader or route it to channel 1 or 2 and control it with the respective faders. The 4th channel on the scratchbox is the Aux/Session input. This is a line input (with a 500mV sensitivity) of which the level can be controlled with the Aux/Session level potentiometer. To connect a digital input S/P DIF (Sony/Philips digital interface format) coaxial signal, there is an optional digital session/aux/back-tape input unit available. This unit can easily be mounted inside the mixing panel. With this option a digital signal can be connected to the digital input. The level must be adjusted with the digital input level potentiometer. This optional digital input unit can be ordered at every authorized RODEC-dealer. 10 inch width - 9 units - mixing panel. Front- and top-panel in elegant matt silver paint. Aluminium anodised smooth scratchplate, no obstructions by any paint of text print on the panel. Front-handles to carry the mixer and to avoid unwanted moving of the buttons during use and during connection of the mixing panel. Same height as the Technics famous SL-1200/1210 turntables. 4 Input channels - 2 Phono inputs on gold plated RCA connectors. - 4 Line inputs CH1 + CH2 + CH3/FX-return + CH4/Session/Backtape-in. - 1 Microphone input on COMBO (XLR-JACK) connector. Outputs: - 2 Master outputs on RCA connectors. - Symmetrical output with XLR connectors on master 1. - 1 Aux/FX-send output on RCA connectors. - 1 Record/aus/session output on RCA connectors. - 1 Strong head-phones output on JACK (6,35mm - 1/4 inch) and mini-JACK (3,2mm - 1/8 inch). Control functions channels 1 and 2: - Phono/line input select switch. - Channel 1-2 reverse switch. - Rotative level control per channel. - Triple tone control with short faders, for very fast manipulation of the audio spectrum (+10dB/-21dB). - Aux/FX-send push button for routing the signal via external effects-units. - Wet/dry fader to mix between signal without effect and signal with effect. - Easy slide 45mm fader specially designed for high speed operating. - Channel fader reverse switch with LED indication at the front. - Channel fader curve control with potentiometer at front. - Easy slide digital optical long life time crossfader, with friction control screw and cut-in distance control screws, to fade between channel 1 and 2. - Crossfader reverse switch with LED indication at the front. - Crossfader curve control with potentiometer at front. - PFL select fader, to create a mixed signal of channel 1 and 2 in the headphones. All volume- and curve-controls on channel 1 and 2 are done by a microcontroller controlled VCA. The channel-faders, cross-fader and cut-switches can easily be replaced via the top-panel after lifting of the scratchplate. Control functions channel 3: - Mic/line input select switch. - 0dB LED to adjust the level. - Dual band equalizer with rotative potmeters. - Routing switch to route the signal to channel 1 or 2 or directly to the mix. - Short channel fader for fast operation. Soft touch rotative knobs for better grip on all rotative potmeters. Very smooth, extremely strong, metal plated matt chrome coloured knobs on all channel faders, cross fader and PFL-select fader. Mode switch to select mono or stereo operation of the mixing panel, ideal for working with records with different left and right tracks. Two bright VU-meters to show the levels of the inputs or mixed signal. Normal and upside down text print at the back panel to facilitate connection. Soft rubber anti-slide buttons at the bottom of the mixer. Power switch on the back of the panel, to avoid accidentally switching off the panel. External power supply, to reduce disturbances.